Referee: Alan Wilkie (Chester-le-Street) a quick return for the whistler who took charge of Newcastle's kickabout against Boro at the Riverside Stadium eight days ago. "It was a very good exercise - the players have done very well pre-season and they've given me a problem for Saturday now there are so many deserving of a game. "The lads have worked so well and been so genuine....we've got far greater strength in depth than we had last year." United played their first home friendly since the Newcastle Exhibition Super Challenge tournament when they faced Middlesbrough and Sporting Lisbon on successive days during August 1992. Since then, they have taken part in 36 successive kickabouts away from home. Having faced Juve in Italy a year earlier, the two sides renewed acquaintence on Monday, although the Italians were without World Cup trio Zinedine Zidane, Didier Deschamps and Edgar Davids. Also missing were the Old Lady's iconic black and white stripes - United donning their blue change strip only for the visitors to wear a mostly white change kit after their first-choice togs apparently went astray while en route from Turin to Tyneside. 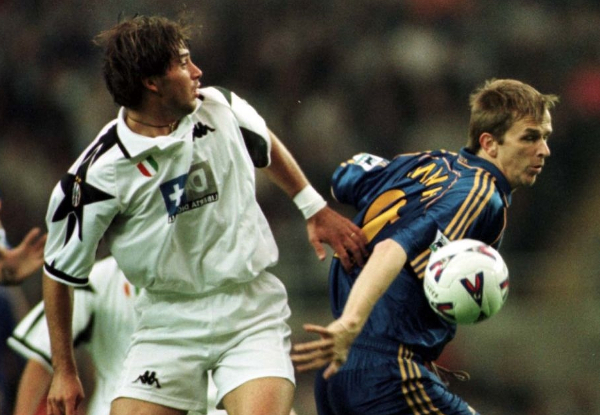 Surviving a scare in the opening seconds when Alessandro Pistone's back pass to Lionel Perez instead reached teenager Marcelo Zalayeta, home debutant Dietmar Hamann ran from halfway before unleashing a fine long-range shot for a memorable opening goal. Stuart Pearce then doubled United's lead with a smart finish after Alan Shearer knocked a free kick into his path, although his side didn't have things all their own way. Jocelyn Blanchard's late curler reduced the arrears for the visitors, Alessandro Del Piero having earlier seen two efforts chalked off before he was withdrawn amid a standing ovation.